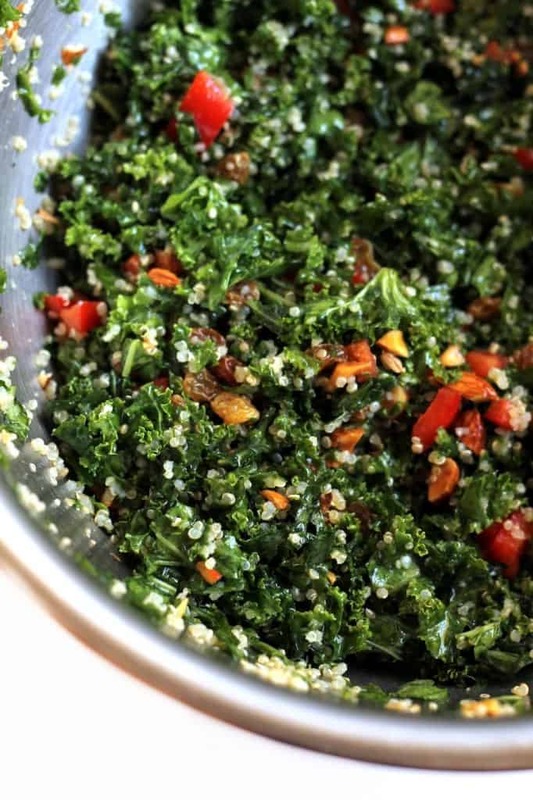 If you’re gonna eat kale, you should probably eat it in this sensationally superb salad. This salad is da bomb because it’s looks all kaley but doesn’t taste all kaley. Because it sounds like rabbit food but doesn’t taste like rabbit food. I mean holy moly….this ensalada is a downright dream boat. A real treat for the taste buds. The toasty almonds, the sweet golden raisins (which may I add are far superior to regular raisins), the simple lemony dressing…I can’t even. I think this would be over the top fab with avocado and some feta, but I wanted to keep it vegan-friendly for Alchemy customers since some of our other salads are full o’ feta. Avocado browning in a kale salad kind of ruins the whole yumtastic image of this healthy salad, but feel free to add it in at home if you’re eating it the same day! Speaking of Alchemy, be sure to head on over to The Micro Harvest for a little Q & A action! There’s definitely some plant-based protein in this bad boy from the quinoa, but I like topping it with a Luna burger (or whatever veggie burger you prefer) when I’m feeling hangry pants. I’ve been loving having this on hand in the fridge for lunches since it gets even better over time as the dressing marinates. WIN. I love helping people love kale. Kale is like exercise. You know it’s super good for you but you don’t want to do it. Well consider me your kale personal trainer. It’s my mission to make you like kale. To make you LURVE kale. Mission accomplished, you kale lovin’ fools! A lemony kale salad packed with quinoa, toasted almonds, and golden raisins. 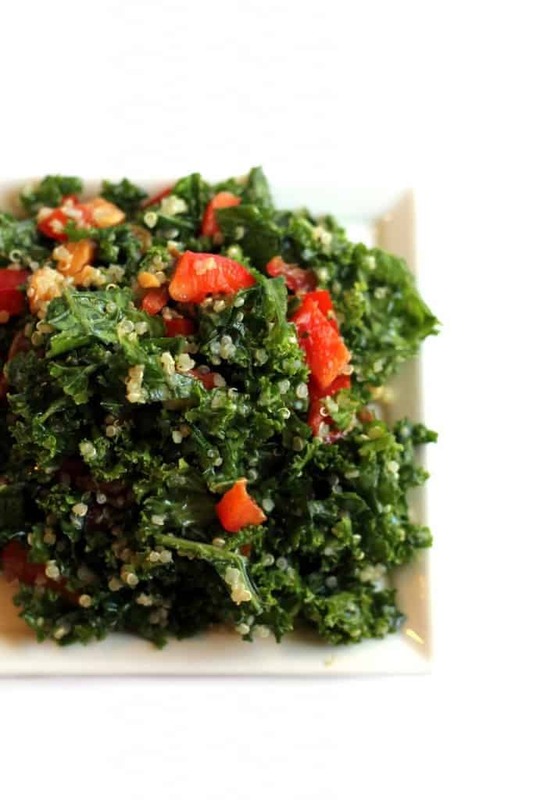 Place chopped kale in a large bowl. Pour dressing on top and massage dressing into leaves for a couple of minutes (using your hands) until kale is broken down. Add cooked quinoa, raisins, almonds, peppers, and avocado. Toss to combine. This is gorgeous! On my list to make!! How do you cut the kale so fine? Do u use a knife or kitchen wiz etc.? I just chop it into small pieces! 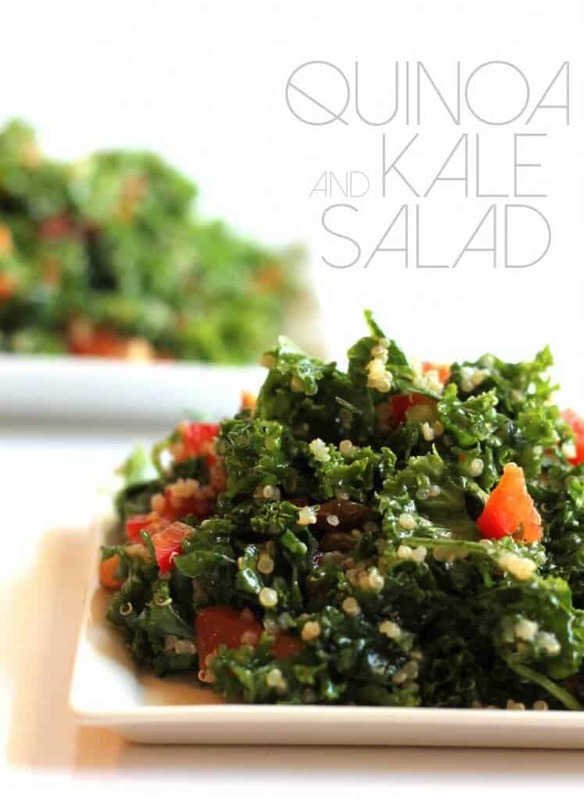 I love Kale and this salad looks like a wonderful and simple way to eat it. Can you imagine that kale isn’t sold in Belgium all year round? Haha, I desperately wait until it is in season again every winter and then stock up on it :) Pinned! I grow it all year round in northern Australia. I’m surprised it is not available in summer in Belgium. Good luck. Loved featuring you & Alchemy!! XO! mmm.. I have been in love with kale and quinoa lately!! Making this for sure! I am going to join hands with you as a kale personal trainer. I’m obsessed and need to just grow it myself! Looks delish and I would also totes throw on the avocado and feta. Gurrrrrl this has your name ALL over it. I usually put cranberries in my kale salads, so I bet raisins will be just as great. For some reason I think golden raisins are so much better than regular ones! They add the best sweetness and texture! Oh man oh man! I’m sending this to my mom, it is right down her alley! Might give it a try myself since you said they kale isn’t too kale-y hahaha. Hahaha there is a fine line between just kaley enough and too kaley! I am loving kale more and more! I need to get on to all the recipes from my new book that are ear marked. 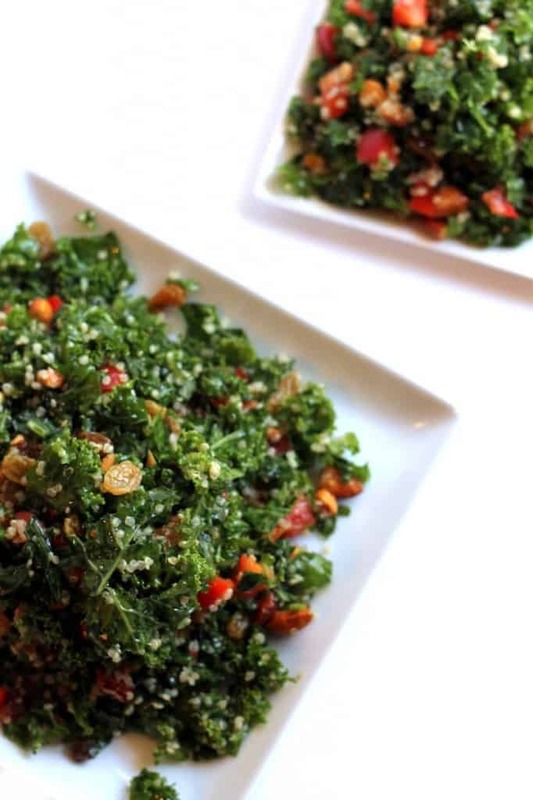 Simple flavours seem to win over the kale hating crowd and this recipe looks perfect! I agree! The simpler, the better. I will become addicted to this salad so easily! Just made this….delicious!!! Is the dressing something that can be made ahead of time and if so, does it need to be refrigerated? Fabulous! Yes, the dressing can be made ahead of time and yes I’d refrigerate it! I had everything on hand to make this salad (except I used dried cranberries instead of raisins), so it called to me when your New Year’s post popped up this morning. This is in the fridge chillin for lunch! It looks so yummy. Cannot wait to taste. Fabulous! I bet it would be great with cranberries. I hope you liked it! This looks super delicious! What do you think about replacing the almonds with peanuts and the lemon juice with either lime or orange juice? I am wondering if this would still taste good. I don’t calculate nutrition info, sorry! Wanted to let you know about a yummy substitution I made here. Thought I had 2 lemons, only had 1. Used 1 lemon and 1 orange. Yum! Yum! And yum! Also used cranberries. (I live with a raisin hater). This salad is sooooo good, thanks so much for your amazingly inspiring recipes. That sounds amazing! I know there are lots of raisin haters out there, so I’m glad it was yummy with another dried fruit! Girl, I just made a nice big batch of this for the first time and I LOVE it! My hubby even loved it and asked for more (he’s normally not a healthy food lover at all). I’d never massaged kale before, but did it, and it turned out SO good. TY! I see the recipe has lemon….. the perfect foil for the ‘browning’ of any added avocado. Maybe just sprinkle a little extra lemon juice on the avocado to keep it from browning. Hi Maria! I’m so glad you’re enjoying the recipes! I would prefer if you posted the link to the recipe rather than writing out the recipe. Thanks! I recently came across this website, and decided to make this Kale and Quinoa Salad, since I have so much curly kale growing in my garden. Well, I’ve made it twice in the past 3 days! The 2nd time I made it, I added a ton more kale than the recipe asked for, and added more roasted almonds (I use the 50% less salt from Trader Joe’s). Delicious!!!! I doubled the recipe of the dressing the 1st time I made this, and still haven’t used it all. Also, since I’m too lazy to massage the kale, I simply add the quinoa to the plain kale (no other stuff), while the quinoa is still pretty warm. This seems to wilt the kale and makes it much more enjoyable and easier to eat. It’s Thnksgiving weekend here in Canada and this beautiful salad graced our thanksgiving table! Along with marinated tofu, yams, turnips, and scalloped potatoes. Yum!! Thanks for the amazing recipe!! Delicious! Day 5 of becoming a Vegan, and this salad is EXACTLY what I needed today! So fresh, and the perfect texture! I reduced the amount of olive oil used, and added apples and Chia seeds! Yummy!!! Thank you!!!! Absolutely loved making this salad! I put apples as well to give it a nice fresh bite. :) Thank you! Hands down the BEST kale salad I’ve ever eaten! I could not stop eating it once I started! Thanks for sharing this recipe. I will be making this over and over. Wowa! Thanks for your glorious comment. I’m so so glad it turned out so well! Great salad I made hubby grilled salmon (I’m a vegetarian ) and grilled some asparagus go with this nice salad…I added 1/2 tsp of dijon mustard to the dressing ingredients gave it a bit more tang was great! I also use cranberriies as i didnt have golden raisins on hand. Thanks for this healthy very tasty salad Alexis.